although our holiday in Croatia is already nearly two weeks over, we just want to thank you very much for the lovely stay we have had in the apartment "white"! We really enjoyed the days in Zagreb. I did want to say thank you again, I enjoyed Croatia, and I know it would not have been as fun if I had been staying in a hotel the entire time. Hello Inzagreb, Thank you very much for everything. Cannot forget kind welcome and great hospitality before and during the time I was in one of your apartments. It was perfect for me and my family in this first contact with Zagreb. Sretan vam Bozic i zelim vama sve najbolje, puno uspjeha, zdravlja i srece! Now that we are home safe and sound I thought I would send you a short message to say thankyou once again for our stay in Zagreb, we really enjoyed it. 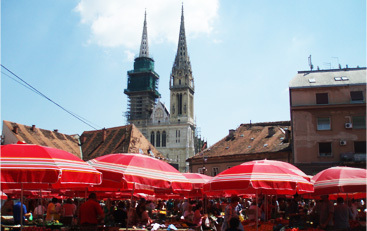 We will certainly tell our families and friends about Zagreb and where they should stay if they visit. Also, we LOVED Croatia... we are thinking about applying for some jobs over there so we can see more of it (sort of a working holiday). Well today is Australia Day and we will be thinking of you racing around like crazy with your celebration event... we hope it all goes smoothly – good luck with it! We had a fantastic holiday... we WILL be back. p.s. We really enjoyed the snacks you bought us! I just wanted to drop you a quick note to let you know we had a great time over there in Zagreb. Also, your husband said that you both were coming over to London in March so I was going to say if you want any information about anything then don't hesitate to send me an email. Take care and I hope you both have a great time over here!